What's Fueling the Battle Over Raw Milk? What could be more innocuous than a glass of milk? A lot, it turns out. Milk may be a symbol of wholesomeness for most of us, a childhood staple associated with furtive Oreo feedings or the sweet residue of disintegrated breakfast cereal. But for some Americans, milk has become a test of their freedom. And they're not paranoid kooks either; the government really is out to get them, authorizing seizures of bottles and jugs of unpasteurized milk and, in one recent case, a full-on, agents-brandishing-guns raid. Thus rages the raw-milk war. Currently, under federal law, it's illegal to sell consumers unpasteurized milk that has been transported across state lines. Raw milk cannot be sold at all in 10 states. In 30 states, it can be sold only by certain farms under certain conditions. And in the remaining states, retail sales are allowed but are greatly hindered by technicalities. While no Clockwork Orange-style milk speakeasies have sprung up yet (that we know of), an underground railroad has emerged to get milk from cows to consumers without any high-tech processing in between. Raw milk's admirers claim it contains beneficial bacteria, enzymes, vitamins and amino acids that get destroyed by the burst of high heat that is pasteurization. Plus there's the fact that raw milk tastes fantastic: rich, full-bodied, herbaceous, creamy. All that weighs but little with the federal government, which is threatening to crack down on unpasteurized milk in all 50 states. To the FDA, it's a basic health issue. There are certain pathogens  including salmonella, campylobacter, listeria and E. coli  that pasteurization keeps at bay. Far from being an elixir, raw milk is a disease waiting to happen, public-health officials say. According to the Centers for Disease Control and Prevention (CDC), from 1998 to 2008, more than 1,600 people got sick from drinking raw milk; 187 had to be hospitalized, and two died. "Raw milk is an inherently dangerous product, and it really should not be consumed by anyone at any time for any reason," a representative from the FDA tells TIME. Now comes the proposed Food Safety Modernization Act, federal legislation that would improve the FDA's ability to trace outbreaks and give the agency  which can already fine companies that knowingly sell contaminated foods  the power to order recalls. If the bill is passed by Congress, it seems raw milk will be spilled, and there's nothing for its fans to do but cry over it. And there are plenty of raw-milk fans. Despite raids like the simultaneous ones in July on a members-only food club in Venice, Calif., and on one of its suppliers in nearby Ventura County, an increasing number of Americans have taken up the cause of raw food. The category is not limited to milk. Similar debates have arisen regarding almonds, honey and other foods under FDA scrutiny. But none seem to have stirred the same anger as the one over raw milk. Supporters say they know the milk may contain pathogens; the most ardent say they welcome the bugs, many of which have peacefully resided in our guts for thousands of years. All agree that they should be able to drink raw milk if they want to. Raw-milk advocates question why this age-old product is being so closely regulated while the practices of vast feedlots and food processors are not. Scott Trautman, a Wisconsin farmer who lost his only corporate customer last year because he was selling raw milk on the side, believes the crackdown on raw-milk microdairies is essentially a way for Big Dairy to eliminate the competition. Megacorporations are "going to pick up these farms for 10 cents on the dollar," he says. "That's the endgame in all this." The small dairies looking to sell raw milk and cheese out of state claim to be infinitely cleaner than megadairies. "Pasteurization covers a multitude of sins," says Elizabeth MacAlister of Cato Corner Farm in Connecticut, where retail outlets are allowed to sell raw milk. "It's just traditional for health departments to be anti  raw milk." 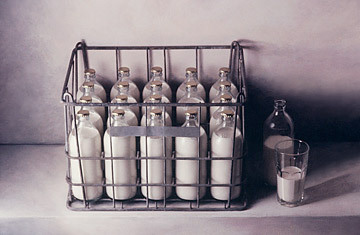 What's interesting about the raw-milk war is the way it has jumbled the usual political lines. Liberals have been almost universally in favor of greater governmental oversight of the food chain. Eric Schlosser, author of Fast Food Nation, even wrote an op-ed recently in favor of the Food Safety Modernization Act. But when it comes to raw milk, lefty, hemp-wearing types have made some strange bedfellows  like archconservative Texas Congressman (and former Libertarian presidential candidate) Ron Paul, who in 2007 introduced a bill to legalize the sale of raw milk. Meanwhile, some of the decisions made by local health authorities, like Wyoming's recent scrutiny of public potlucks (which, after all, entail serving food from unlicensed kitchens), suggest an encroachment on our civil liberties of the kind that gets black-helicopter bloggers riled. There could be some middle ground. Already, there's an alternative pasteurization technique of heating milk to a lower temperature for a longer time that satisfies the FDA while maintaining a sky-high level of flavor and body. For the most part, though, it's unlikely that any of these work-arounds will appease raw-milk fans, whose desire is not just for a healthy or tasty beverage but also for the right to drink unmolested. "People should have the option to consume milk the way they want," says Gumpert. Whether it's good for them or not. This article originally appeared in the September 20, 2010 issue of TIME.